The Monica is an impressive hotel with an elegant atmosphere, set in lovely gardens with an excellent range of facilities including a pool. Family run, it offers personal service with attractive, comfortable guest rooms, good food and a delightful setting. We stayed in Hotel Monica on a half board basis,the hotel is beautifully kept,the staff are friendly and helpful.Our room was a bit on the small side, and the bathroom tiny, but we would stay there if we were going back to this area. The only criticism,and it was echoed by all the guests was, that the dinner in the evening was cold, the plates were cold and so was the food. If we would return to the Monica,it would be on a Bed and Breakfast basis, as the breakfast was great. We booked a two week stay at this hotel mainly because it was the closest to the town centre. 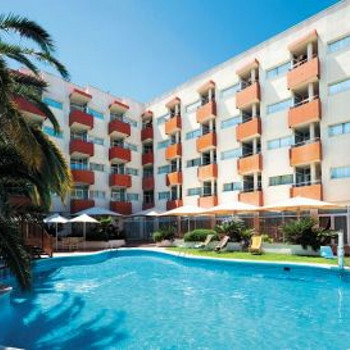 Many of the other 'Cambrils' hotels are at least 2 or 3 miles away or even nearer to Salou. The hotel is small and very friendly and very close to the beach. It caters mainly to the Spanish which is no problem for adults but my 6 year old found it difficult to find others her age to play with. That aside, she loved it. The food is very Spanish and in my mind, very good. The service was great and even the owner (Monica) was around most days and was very friendly. She took a lot of time to get to know the customers. The whole atmosphere of the hotel and Cambrils is relaxed and a great place to visit. We are going back again this year. I cannot recommend the hotel enough. We had a superior room overlooking the pool. The room was large and nicely decorated. We only ate dinner at the hotel once and it was the usual sort of hotel buffet stuff. Breakfast was good with a large selection. The pool is not very big but not many people were using it while we were there so it was not a problem. Overall we were very happy with the hotel. Rooms a good size and very clean, hotel in all was kept to high standard at all times. Food was fair to good but was lacking choice. The hotel location was perfect. Staff very helpful and freindly. The Monica is in a great location in Sambrils near to the beach and the town. The rooms are very nice and comfortable and it is possible to upgrade to "superior" rooms. The food is excellent and of very high quality, we decided on fish most nights but there is always a choice of 4 dishes for both first and second courses. The resturant staff are very efficient and pleasant while the reception is run very professionally with friendly women. The swimming pool and gardens are ideal with lots of beds and deck chairs available. There was a singer with dancing on Saturdays but the hotel was usually quiet in the evenings.